No. These are not words from a Hollywood set. Instead these are the words of 5th graders from Ms. Snoke and Schulman’s class at PS 4 in Washington Heights, New York. You'd never know that not long ago, the teacher of this classroom struggled to find ways to inspire students to be motivated to learn. In the classroom today, the students recently finished reading Island of the Blue Dolphins. They were motivated and fully engaged as they dispersed into various parts of the room acting out the scenes from the script they had written days earlier. Prior to their performances this day, the class spent time watching videos of other students performing scenes from books then discussed what went well and what could be improved. As a result they were well-equipped to transfer this knowledge to their own work. 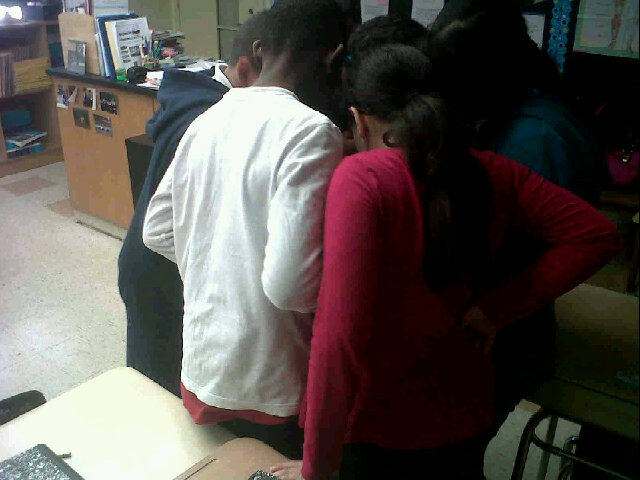 After students filmed their scenes they huddled around their flip video camera to discuss what worked and what needed improvement. 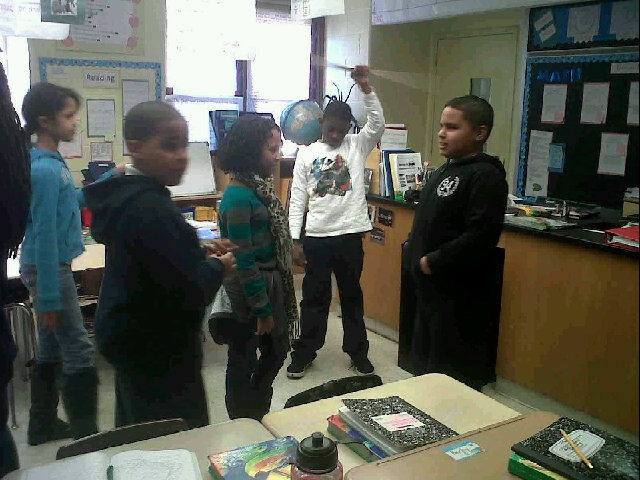 For instance one student said, "You should use your spear like you are really spearing a fish." Another demonstrated how to make larger hand gestures. After self reflection and feedback from the rest of the group, after each take they jumped right back into the work of revising their script and re-taking the scene. In essence these students were engaged in the editing, revision stages of the writing process. As a former literacy coach, I witnessed first hand the struggles teachers had motivating students through these stages when done with pen and paper. Additionally, traditionally, edits and revisions were often made after teacher-directed feedback. These fifth grade students completely owned the learning and were self-directed and motivated to edit, revise, their work following reflective analysis and peer review. The teachers explained it this way. Often when a student writes, it’s not clear when something doesn’t sound right. When the students act out their writing, it immediately becomes clear when something doesn’t sound right and they jump back to their scripts to revise. Additionally, when students get out of their seats and act out the scenes from the book they read, the words and concepts that they may not have understood well, really come to life. I’m convinced that when I measure comprehension, I will find that students understood this story better than the others they have read. Their advice to other teachers who may be interested in doing this type of work with their students is this. Don’t worry about students producing perfect videos. In the end, the reality is that the learning is in the process of making the videos, not the final product. When I spoke to the students and asked them if they enjoyed studying a book this way. Every student agree they preferred learning this way over the traditional reading of a story then responding in their notebooks. As a dug a little deeper to find out why, one student summed it up well. This is an amazing idea. And also, Island of the Blue Dolphins was one of my favorite books as a kid. Using Flipcams is a fun thing to do, but this shows that teachers can also use them to motivate and teach! This is a great way to connect students to great books, like Island of the Blue Dolphins. Well done, teachers and students!